Search teams have found the flight data recorder from the Yemenia Airways plane that crashed off the Comoros Islands in June, killing 152 people, the chief investigator said Friday. An operation to retrieve the recorder has begun, said a statement from investigator Ali Abdou Mohamed. 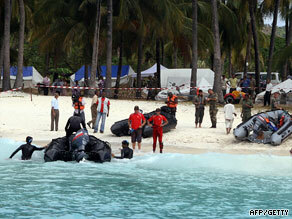 The Airbus 310 crashed into the Indian Ocean, carrying 142 passengers and 11 crew members. It originated in Yemen’s capital, Sanaa, and went down just miles from Moroni, the capital of the Comoros Islands. One person, a 13-year-old French girl, survived. The recorder could contain information to help determine what caused the crash. The plane had tried to land at the airport in Moroni, then made a U-turn before it crashed, Comoros Vice President Idi Nadhoim said soon after the accident. A French official said that country had banned the plane after it failed an aviation inspection in 2007, but Yemenia Airways was not on the European Union’s list of banned airlines. Passengers on the flight included 66 French citizens, 54 Comorians, one Palestinian and one Canadian, according to Yemeni and French officials. The crew was made up of six Yemenis, two Moroccans, one Ethiopian, one Filipino and one Indonesian. The Comoros Islands are between the east African country of Tanzania and the island nation of Madagascar.